Hi all. I am returning to magic after many years of inactivity. When I was about 11 or 12 back in the early to mid 1970's I was given a magic set for Christmas that got me started. I would love to find an example of that set or just see some pictures of it. I can't picture the box and I want to say it was either a Mark Wilson or Marshall Brodien set but I could be wrong about that. I have poured over tons of pictures and listings on line but have not found it yet. It had standard tricks like paddles and sponge balls etc but the one unusual trick I remember it having was a black plastic tube aprox. the size of a soda can, open at both ends. You would show it empty and pass a clear plastic tumbler down through the tube to prove no barriers and then pour water into the tube without it coming out the bottom, then you would pass the tumbler back up through the tube and it would come out the top full of the water. This is a trick that my set had and I do not see in any other vintage set. Can anyone tell me the name of my old set or even better provide some pictures? Many thanks. - Don. The trick you describe sounds like the Chen Le Water Suspension. I had one when I was a kid but it produced a glass of milk at the end. I'm not familiar with magic sets but maybe that will help you in your search. Thanks! I'll add it to my search. Sounds a lot like the T.V. 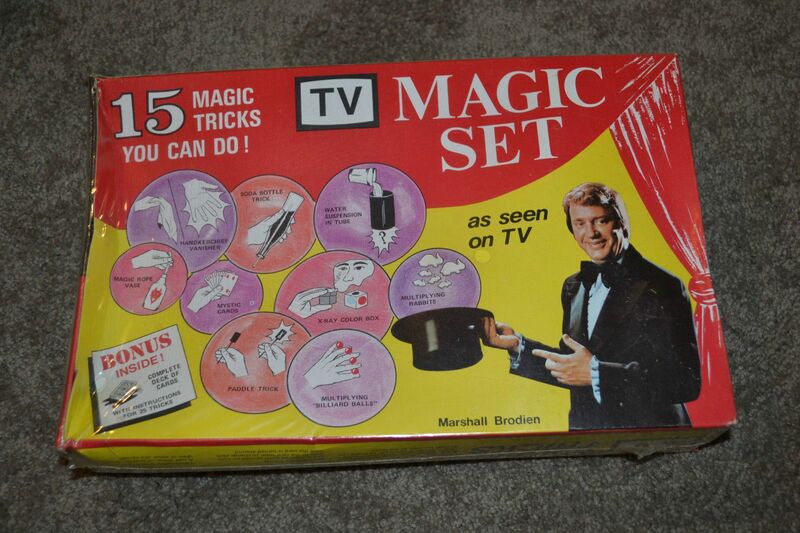 Magic Set I got back in 1973. It was branded by Marshall Brodien, as you note, after the overwhelming success of his T.V. Magic Cards. As I recall you were also instructed to use the accompanying wand to "prove" the tube empty. Pretty cool trick for a 13 year old. Thanks Anthony. Adding TV to the search brought up this set. This MAY be it. I can't say I remember the box but I quickly put all my tricks into an old suitcase that felt like a traveling magic show at the time so I didn't spend a lot of time with the box. I now remember that it wasn't sponge balls that came in the set it was the balls with the shell. All the other tricks in this set correspond to my original kit including the sponge rabbits and the vase suspension. Man I'd love to get one of these sets mint in box and then find an old suitcase to put them in. Now that would be re living my childhood! Thanks for the help guys. Cheers! Aw man... That Prayer Vase fooled hell out of my sister. Interestingly I recently saw TC Tahoe lecture where he updated the effect using a root beer bottle. The pull was interesting, as I recall, but not practical for someone who always wore tee shirts. For some reason I thought a thumb tip was included as well; a metal one! I also remember getting a great deal of mileage out of the bunnies and the die cube. Wow talk about a blast from the past! Anthony, I got mine in 1973 as well. Yep That’s it. It is a mass produced knock off of a knock off of the UF Grant Classic Chen Lee Water Suspension. I bought the original as a kid from Kanter’s in Philly. Twice the size as in the magic kits. The original had a tin tube very nicely painted and sturdy and a standard sized plastic tumbler for the glass. The gimmick was matched to size and very well made. Even today ... almost 50 years later ... the plastic gimmick is still working and in one piece. Thanks EVILDAN! That is it! I would have been 13 in 1975. Perfect.